A rich effect was produced on the carved console tables, chairs, stools and frames intended for gilding, by the method employed by the Venetian and Florentine craftsmen, the gold leaf being laid on a red preparation, and then the chief portions highly burnished. There are in the South Kensington Museum several specimens of such work, and now that time and wear have caused this red groundwork to shew through the faded gold, the harmony of color is very satisfactory. Other examples of fifteenth century Italian carving, such as the old Cassone fronts, are picked out with gold, the remainder of the work displaying the rich warm color of the walnut or chesnut wood, which were almost invariably employed. Of the smaller articles of furniture, the "bellows" and wall brackets of this period deserve mention; the carving of these is very carefully finished, and is frequently very elaborate. The illustration on page 51 is that of a pair of bellows in the South Kensington collection. The enrichment of woodwork by means of inlaying deserves mention. 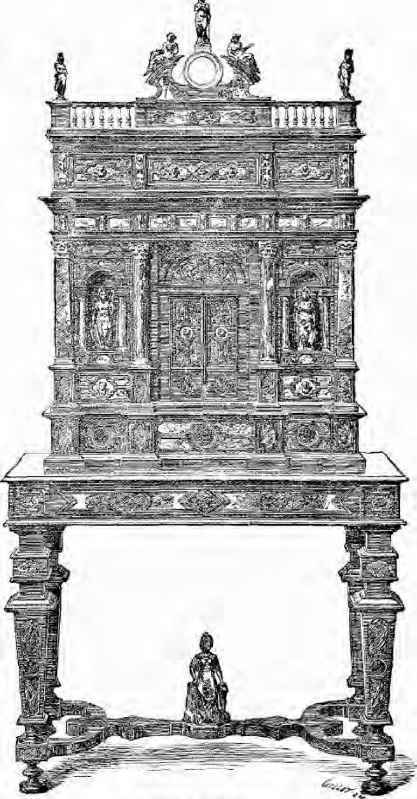 In the chapter on Ancient Furniture we have seen that ivory was used as an inlaid ornament as early as six centuries before Christ, but its revival and development in Europe probably commenced in Venice about the end of the thirteenth century, in copies of geometrical designs, let into ebony and brown walnut, and into a wood something like rosewood; parts of boxes and chests of these materials are still in existence. Mr. Maskell tells us in his Handbook on "Ivories," that probably owing to the difficulty of procuring ivory in Italy, bone of fine quality was frequently used in its place. All this class of work was known as "Tarsia," "Intarsia," or "Certosina," a word supposed to be derived from the name of the well-known religious community—the Carthusians—on account of the dexterity of those monks at this work.6 It is true that towards the end of the fourteenth century, makers of ornamental furniture began to copy marble mosaic work, by making similar patterns of different woods, and subsequently this branch of industrial art developed from such modest beginnings as the simple pattern of a star, or bandings in different kinds of wood in the panel of a door, to elaborate picture-making, in which landscapes, views of churches, houses and picturesque ruins were copied, figures and animals being also introduced. This work was naturally facilitated and encouraged by increasing commerce between different nations, which rendered available a greater variety of woods. In some of the early Italian "intarsia" the decoration was cut into the surface of the panel piece by piece. As artists became more skilful, veneers were applied and the effect heightened by burning with hot sand the parts requiring shading; and the lines caused by the thickness of the sawcuts were filled in with black wood or stained glue to give definition to the design. 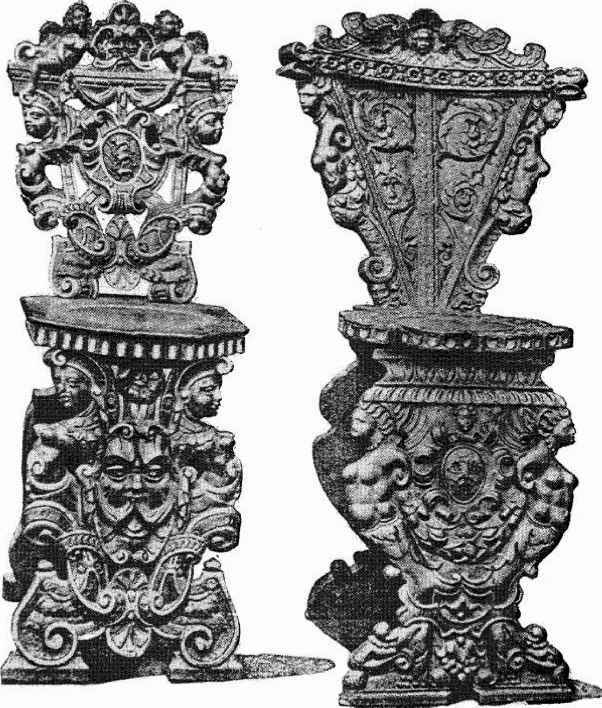 The "mounting" of articles of furniture with metal enrichments doubtless originated in the iron corner pieces and hinge plates, which were used to strengthen the old chests, of which mention has been already made, and as artificers began to render their productions decorative as well as useful, what more natural progress than that the iron corners, bandings, or fastenings, should be of ornamental forged or engraved iron. 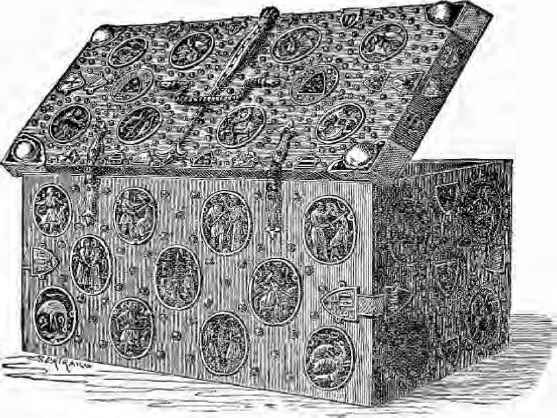 In the sixteenth century, metal workers reached a point of excellence which has never been surpassed, and those marvels of mountings in steel, iron and brass were produced in Italy and Germany, which are far more important as works of art, than the plain and unpretending productions of the coffer maker, which are their raison detre. 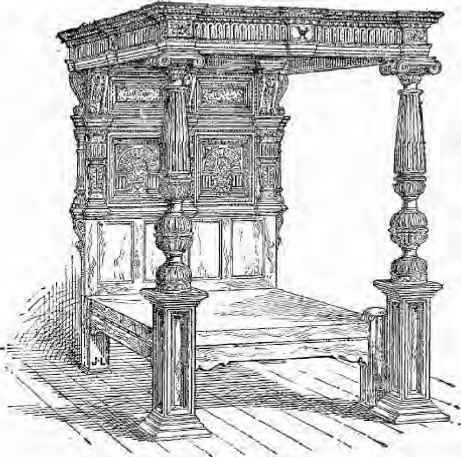 The woodcut on p. 53 represents a very good example of a "Coffre-fort" in the South Kensington Collection. 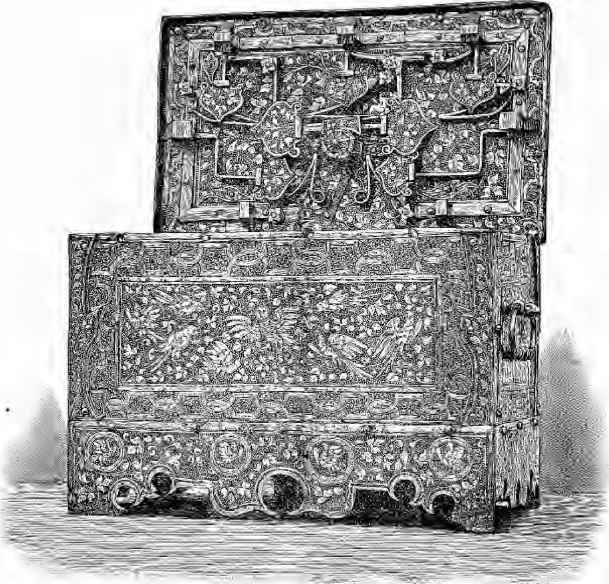 The decoration is bitten in with acids so as to present the appearance of its being damascened, and the complicated lock, shewn on the inside of the lid, is characteristic of these safeguards for valuable documents at a time when the modern burglar-proof safe had not been thought of. 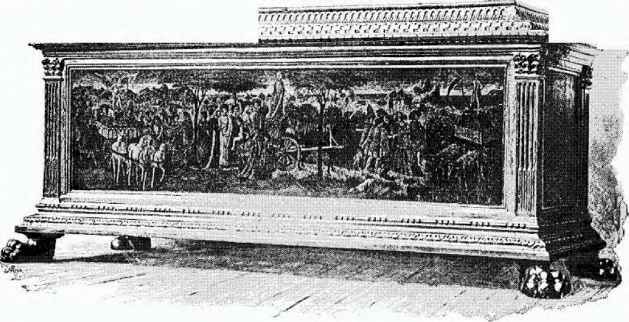 The illustration on the following page is from an example in the same museum, shewing a different decoration, the oval plaques of figures and coats of arms being of carved ivory let into the surface of the coffer. This is an early specimen, and belongs as much to the last chapter as to the present. 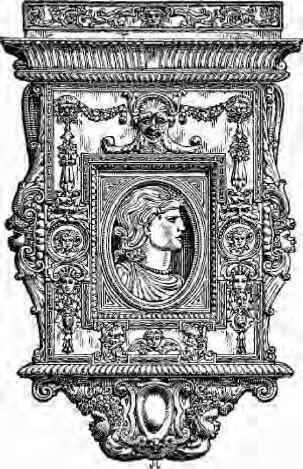 "Pietra-dura" as an ornament was first introduced in Italy during the sixteenth century, and became a fashion. This was an inlay of highly-polished rare marbles, agates, hard pebbles, lapis lazuli, and other stones; ivory was also carved and applied as a bas relief, as well as inlaid in arabesques of the most elaborate designs; tortoiseshell, brass, mother of pearl, and other enrichments were introduced in the decoration of cabinets and of caskets; silver plaques embossed and engraved were pressed into the service as the native princes of Florence, Urbino, Ferrara, and other independent cities vied with Rome, Venice, and Naples in sumptuousness of ornament, and lavishness of expense, until the inevitable period of decline supervened in which exaggeration of ornament and prodigality of decoration gave the eye no repose. Edmond Bonnaffe, contrasting the latter period of Italian Renaissance with that of sixteenth century French woodwork, has pithily remarked: "Chez cux, Tart du bois consiste a le dissimuler, chez nous a le faire valoir." In Ruskin's "Stones of Venice," the author alludes to this over-ornamentation of the latter Renaissance in severe terms. After describing the progress of art in Venice from Byzantine to Gothic, and from Gothic to Renaissance he subdivides the latter period into three classes:—1. Renaissance grafted on Byzantine. 2. Renaissance grafted on Gothic. 3. Renaissance grafted on Renaissance, and this last the veteran art critic calls "double darkness," one of his characteristic terms of condemnation which many of us cannot follow, but the spirit of which we can appreciate. Speaking generally of the character of ornament, we find that whereas in the furniture of the Middle Ages, the subjects for carving were taken from the lives of the saints or from metrical romance, the Renaissance carvers illustrated scenes from classical mythology, and allegories, such as representations of elements, seasons, months, the cardinal virtues, or the battle scenes and triumphal processions of earlier times. 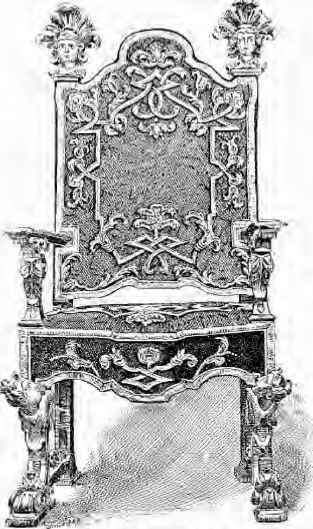 The outlines and general designs of the earlier Renaissance cabinets were apparently suggested by the old Roman triumphal arches and sarcophagi; afterwards these were modified and became varied, elegant and graceful, but latterly as the period of decline was marked, the outlines as shewn in the two chairs on the preceding page became confused and dissipated by over-decoration.